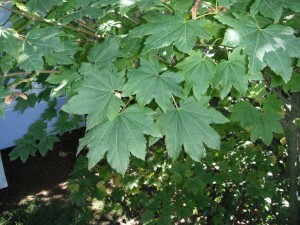 Names: “Vine” Maple, although not really a vine, has very slender, often sprawling, branches. 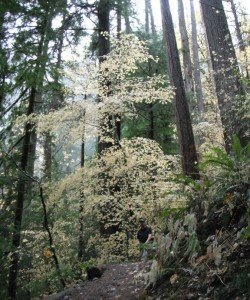 These branches often root to produce new trees, creating dense thickets underneath the shade of taller conifers. It is a small, usually multi-stemmed tree or shrub. Circinatum refers to the “rounded,” regularly lobed leaves. Distribution: It is found from Alaska and British Columbia to northern California, from the east side of the Cascade Mountains to the Pacific coast. 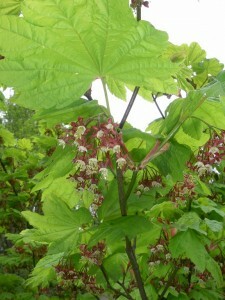 Vine Maple often grows as an understory tree/shrub. 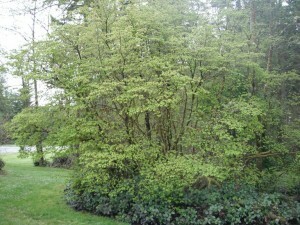 Growth: Vine maple grows to 21 feet (7m) and lives about 80 or 90 years. 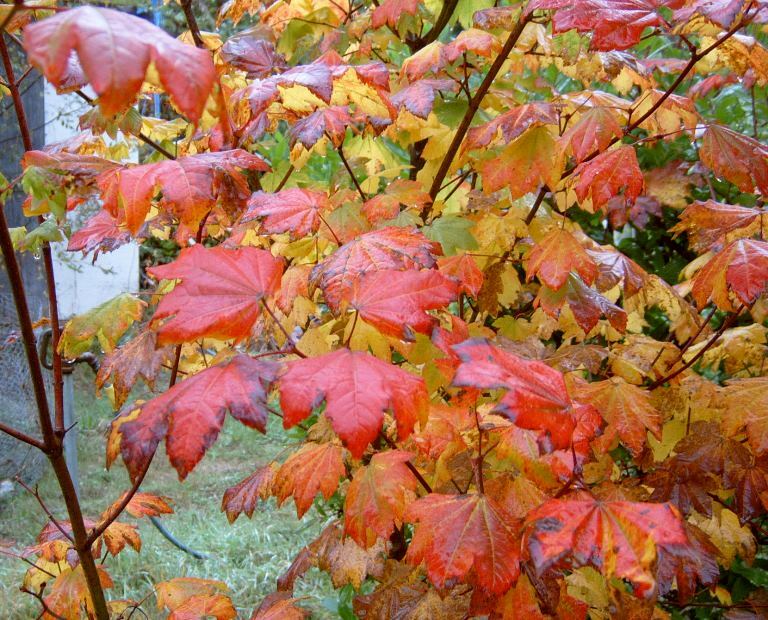 Habitat: Although in nature, Vine Maple is often found in moist to wet places in the shade of other trees, it will also thrive in sunny openings with adequate moisture. Wetland designation: FAC-, Facultative, it is equally likely to occur in wetlands or non-wetlands. White flowers with red sepals. 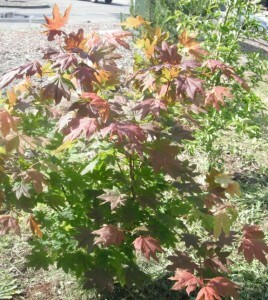 Diagnostic Characters: Like all maples, the leaves are arranged opposite each other on the stem. 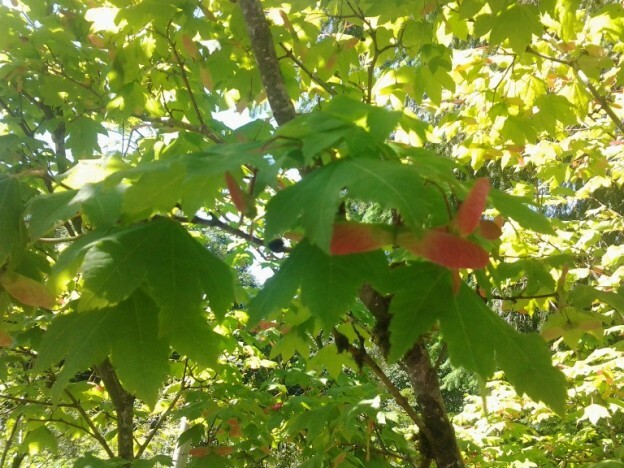 Vine maple leaves have a very distinctive shape. Its symmetric, palmate leaves have 7-9 regularly spaced lobes, all nearly the same length. Young stems are a pale green. White flowers with wine colored sepals are replaced by widely spreading samaras– the paired, winged seeds almost forming a straight line. 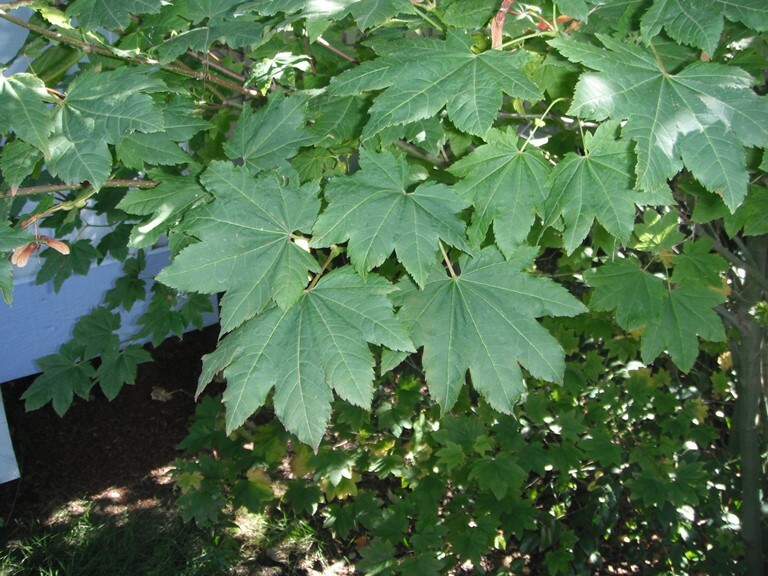 Vine Maples have distinctive rounded, evenly lobed leaves. 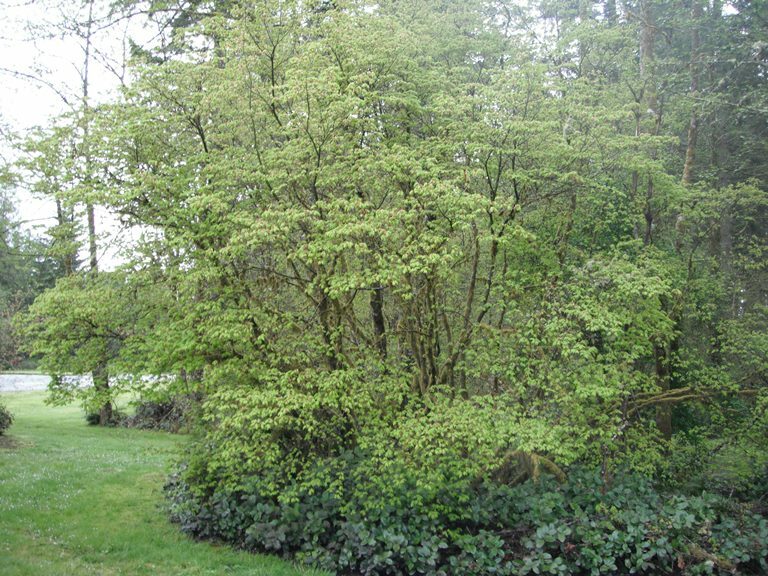 In the Landscape: Vine Maple is one of the most popular native shrubs for landscapes. An enchanting woodland landscape may be created by planting large groupings under the shade of taller trees along with ferns and woodland flowers. 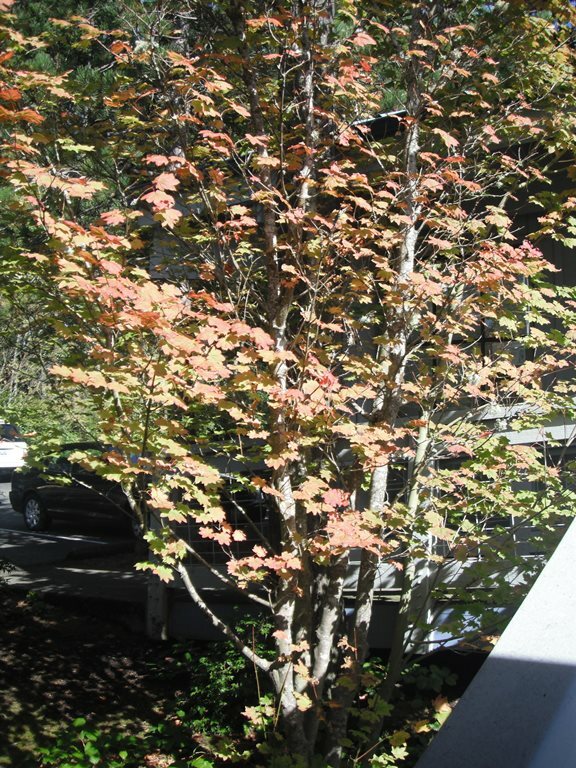 Vine Maple is also a good choice next to buildings and in parking lots. 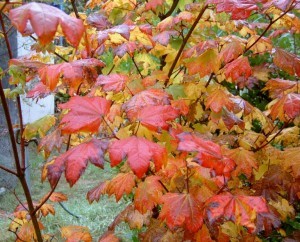 There is some variability in the fall color display. Those growing in shade tend to turn a pale yellow; those growing in sun are more likely to turn orange or scarlet. 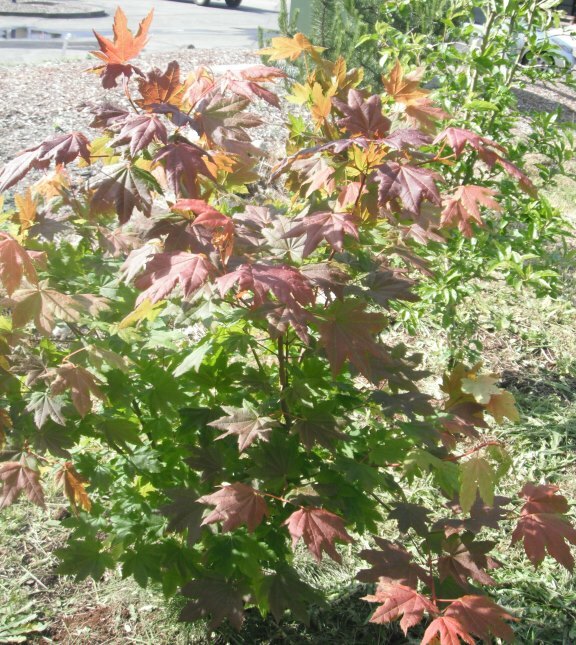 Plants growing in the sun often have redder fall color. Phenology: Bloom Period: April-June. Double samaras ripen September to October and are dispersed through November. 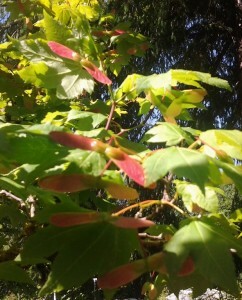 Propagation: Vine Maple seeds do not store well. They are best sown as soon as they are ripe outside or in a cold frame. Germination occurs in late winter or spring. The seeds may also be scarified or soaked for 24 hours, then cold stratified at 40ºF (4ºC) for 2-6 months. 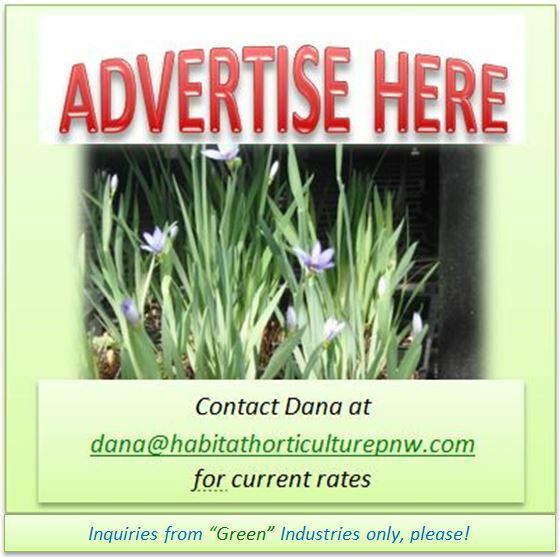 Seeds and seedlings need to be protected from rodents, slugs and other herbivores. 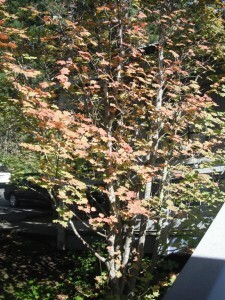 Lower branches may be layered to generate rooted cuttings. 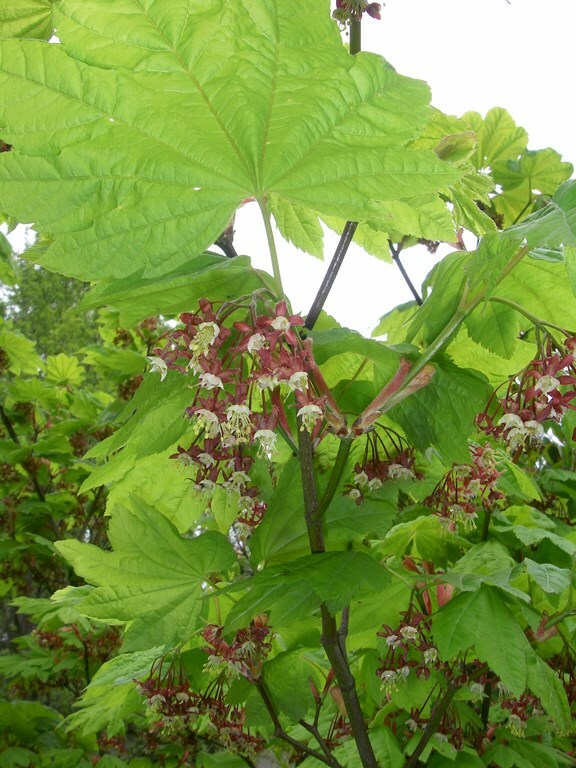 Use by People: Natives used Vine Maple branches for baskets and fish traps. It was often used for firewood. Use by wildlife: Summer foliage is a preferred food for deer and elk. Seeds, buds and flowers provide food for many birds and rodents. Squirrels and chipmunks will cache the seeds. In fact, if you try to collect seeds, you may discover that many of the samaras have already had the seed removed! 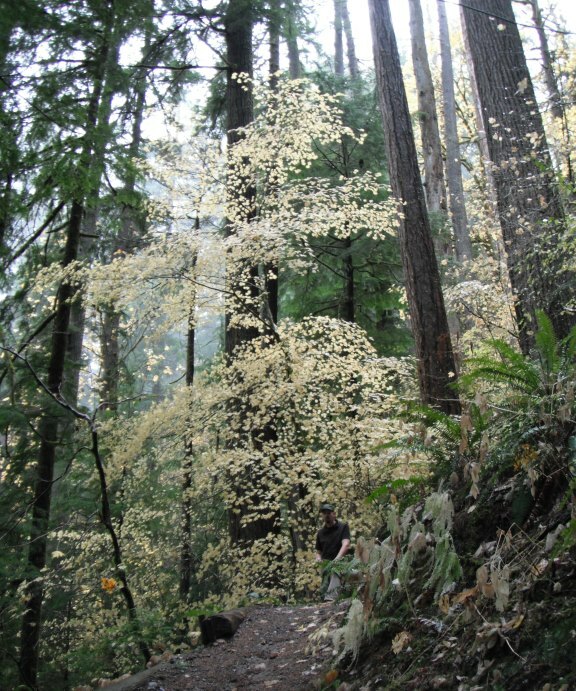 This entry was posted in Broadleaved Trees on June 1, 2015 by habitatdana.